Stopped off here on our way to The Grand Canyon; two awesome sights in one day! 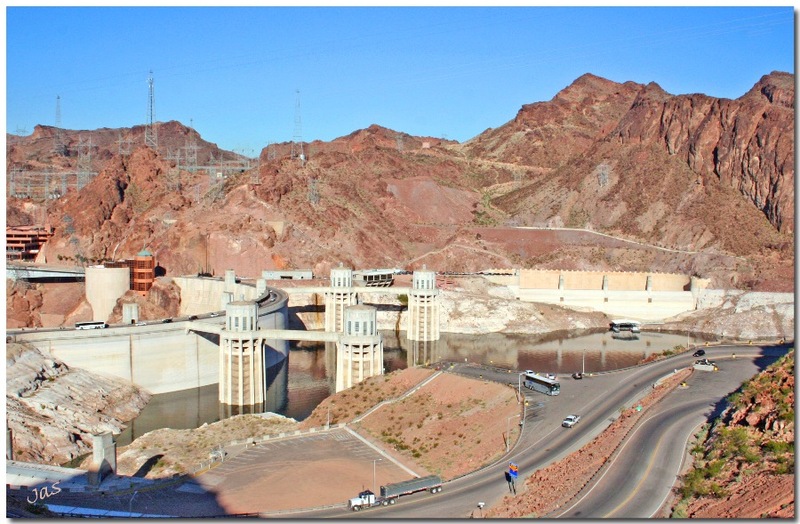 Hoover Dam, also known as Boulder Dam, is a concrete arch-gravity dam in the Black Canyon of the Colorado River, on the border between the U.S. states of Arizona and Nevada. The dam, is named after Herbert Hoover, who played an instrumental role in its construction. Construction began in 1931 and was completed in 1935, more than two years ahead of schedule. Early plans called for the dam to be built in Boulder Canyon, so the project was known as the Boulder Canyon Project. The dam site was eventually moved downstream eight miles to Black Canyon, but the project name remained the same. Alan, thanks for looking in. Had often seen the Hoover Dam in films on TV; never thought I would ever get to see it for real! Guess we were lucky that day, re. the traffic; it was fairly quiet. Hi Jas, What a familiar site lol.. I go over Hoover Dam at least twenty times a year. They are always working on something there as if the traffic is not bad enough. Most of the time it is bumper to bumper, you must have lucked out some how with this photo.